Prior to being asked to interview him, I did not know Dr. George Gonzalez and had not heard of Quantum Neurology® so I had no preconceived idea of what it was about. This proved to be a good thing, because it meant that he had to walk me through its rationale and development. 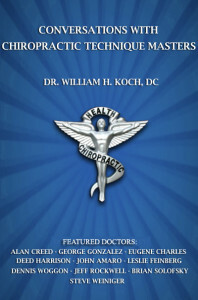 This got my attention because I have always contended that Chiropractic is really about the brain and nervous system. Traditional techniques attempt to normalize the nervous system through improved structural function. Quantum Neurology® seeks to normalize all function by directly accessing and rehabilitating nerve function in a way that has never before been done. I quickly realized that this warranted further investigation and study on my part, so I ordered Dr. Gonzalez’s Fix Series of instructional DVDs as well as those on Motor and Cranial Nerve Rehabilitation. I also got one of his GRT Lite™ therapy units which is necessary to properly do this work. I found Dr. Gonzalez’s teaching style to be one of the best I’ve ever seen. The presentation of his technique is well organized into segments that are easy to study and understand. Beginning with his Fix Series, he demonstrates analysis and incredibly fast correction of frozen shoulders, wrist and elbow, foot, ankle and knee problems. He also has developed effective and very gentle corrections for the cervical and thoracic spine, the lumbar spine and pelvis. Dr. Gonzalez also teaches you his unique method of analyzing the pelvis. Using simple muscle tests, subluxation of the symphysis pubis and anterior and posterior femur head displacements are easily identified. Corrections are then quickly and easily made using the ArthroStim® instrument by Impac, Inc., and are reinforced or “set” with the GRT LITE. The corrections are then confirmed using the same muscle tests, giving both the doctor and patient immediate evidence of improvement. The ease of these corrections and the dramatic differences in pre and post muscle tests are very impressive to the patients, leaving no doubt in their minds that you have done something very positive for them. This is further sweetened by the fact that so little force is involved. Even patients who have resisted seeking Chiropractic care because of fear of “the snap, crackle and pop” adjustments do not find these procedures intimidating or frightening. This alone is a practice builder. I have come to realize that there are more people than most of us realize who fear the joint release and associated sounds that we have been trained to find so satisfying. Quantum Neurology® is the Chiropractic equivalent of painless dentistry. Patients, especially those with previous Chiropractic experience, immediately notice the difference between it and other Chiropractic procedures. Patients enjoy being involved in the interactive process of analysis, corrective treatments and ultimately the retesting to confirm that a correction was actually accomplished. Engaging the patient in this manner completely changes the experience of a visit to the Chiropractor. Impressive as Dr. Gonzalez’s Fix series procedures are, I am even more excited about his Myotome Testing and Cranial Nerve evaluation and rehabilitation. In the Quantum Neurology® Motor Rehabilitation DVD Dr. Gonzalez shows you how to quickly evaluate the spinal cord level by level; how to identify the nerve directly associated with the patient’s problem; then how to rehabilitate the nervous system in seconds by using laser therapy, and how to explain light therapy to patients without wasting a lot of time. Dr. Gonzalez has also discovered a way to evaluate the cranial nerves, uncovering not only gross, but subtle degrees of individual cranial nerve dysfunction. He then goes on to demonstrate his technique of rehabilitating them using his patented GRT Lite™. Nowhere in the field of neurology can we find as efficient and effective a method of not only evaluating but rehabilitating the cranial nerves. Better yet, it is almost magically fast and non- invasive. In the four decades I have been practicing Craniopathy, I have never seen anything to equal Quantum Neurology® for the rehabilitation of cranial nerve function. I am now using Quantum Neurology® Rehabilitation on all of my patients. The results they experience and the enthusiasm they see in me are truly infectious and have sparked an unprecedented rate of new patient referrals and returning old patients. 1. Male, age 70. Right side Bell’s Palsy for 40 years! Left side acute severe Trigeminal Neuralgia, 4 years. Last year he had the Gamma knife nerve deadening procedure. This was invasive and provided very limited short term relief of pain. When I began treating him, he was in almost intractable pain in spite of being on high doses of Neurontin, which provided little relief. After four Quantum Neurology® Cranial Nerve rehabilitation procedures he is 95 % better. His neurologist would probably declare this to be a spontaneous remission or delayed result of the Gamma Knife surgery. The important thing is that the patient knows what helped him. 2. Female, age 47. Neurosurgery 8 years ago for brain tumor. The tumor was benign but could not be removed as it was too intertwined in the brain tissue. A shunt was installed and later had to be redone. Entry complaints were: low back pain, poor equilibrium, difficulty walking, slurred speech and tunnel vision. She has had four Quantum Neurology® myotome and cranial procedures. Low back pain is now gone, equilibrium restored, walking normal, and speech also normal. Overall vision and peripheral vision significantly improved. 3. Female, age 38, diagnosed two years ago with rheumatoid arthritis. She presented with migrating joint pain, most acute in feet and ankles which were severely swollen making it difficult to walk or to wear shoes. She left my office following her first visit walking normally for the first time in many months. Swelling in feet ankles went down immediately, allowing her to put on her shoes comfortably. She actually danced around the office for joy. Subsequent office visits have confirmed the complete resolution of her condition with no return of symptoms. 4. Female, age 59. 40 year history of debilitating back hip and leg pain with which I had previous partial success. What remained was severe left knee and foot pain that resisted my previous best efforts of the past few years. Remarkably, one visit in which I employed the lumbar myotome procedures using the GRT LITE™ provided her with total relief from her persistent knee and foot pain. She is thrilled. 5. Female, age 5. Fell from a second story window 4 months previous to my first seeing her. She had daily headaches, and severe pain and very limited use of her left arm. Bilateral knee pain prevented her from running around like a normal 5 year old. She suffered from severe constipation often not having a bowel movement for as many as 5 days at a time. All symptoms were eliminated after only one office visit using Quantum Neurology® protocol. In the short time I have been using Quantum Neurology® I have seen unprecedented results with difficult cases. Quantum Neurology® Rehabilitation is without a doubt the most “user friendly” chiropractic technique I have ever studied. It provides a whole new level of neurological and orthopedic evaluation of the patient. This method is so efficient that the cervical and thoracic spine, the lumbar spine and pelvis, upper and lower myotomes as well as cranial nerves can all be evaluated in a few minutes. This makes it easy to add to your existing new patient examination and might even replace some of your existing examining procedures. Dr. Gonzalez has organized his procedures and teaches them is such a clear concise way as to make them unbelievably easy to incorporate into any practice. The ArthroStim® hand held electronic adjusting instrument by Impac Inc. and Dr. Gonzalez patented GRT LITE™ are necessary to do this work, but, trust me, they are worth the investment. I used the ArthroStim® in my practice long before I became acquainted with Dr. Gonzalez’s work, but I must admit that in the beginning I was a bit skeptical about the value of light therapy in Chiropractic Practice. Now, having used the GRT LITE™ for 2 months, there is no doubt in my mind that it is critical to providing a level of results that would otherwise be impossible. Quantum Neurology® can easily be learned through studying Dr. Gonzalez’s DVD’s. They are well produced and provide an easily accessed reference for review. The important thing is that they get you started doing this remarkable work. If you want to prove it to yourself with minimal expense, get the Frozen Shoulder Fix DVD. When you see how quickly and easily you can deal with this difficult condition, you will be sold and surely want to know more. Check out the Quantum Neurology website at www.quantumneurology.com, or call 323-653-2818.